Change is a constant with businesses today and Kelcy has deep experience working with a variety of organizations supporting them through transformation and changing the way they do business. Change Management finally has its day in the sun and the demand for it is increasing. It's come a long way from the late 80's and early 90's when it was really starting to emerge on the business scene, and many good change methodologies have emerged since then. But just like any professional discipline it takes more than a methodology to implement successful change. Successful change is more than just 'the people side of projects'. 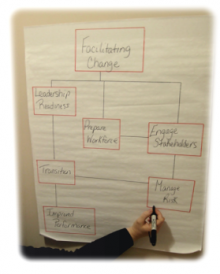 Change is an interactive, complex, and non-linear experience which requires the support of experienced change practitioners who can interpret the needs of the organization through the lens of change, facilitate engagement of stakeholders to create ownership for the change, and increase competence in the organization's ability to lead change forward. This is beyond change management. As a facilitative change consultant, Kelcy skillfully engages leadership to think and work better together to lead successful change. No matter where you are in the change process Kelcy can assist you to design and facilitate a change process that moves your organization forward.